Halleluiah! We have a new rector. The Rev. Andrew Downs joined us October 1, 2014. For the story of this recent journey and a sense of what still lies ahead, see below. In summer 2012, our rector of nineteen years, the Reverend Joseph H. “Chip” Chillington, announced that he would be retiring at the end of the year. That announcement set into motion plans that continued to unfolded as we involved ourselves in the task of finding and calling the right new rector to lead us as we move forward together into the future. The Rev. 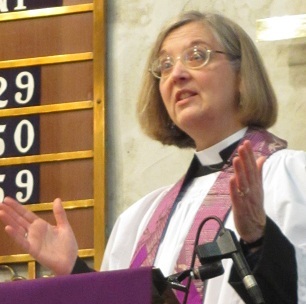 Mary Slenski of Christ Church, Dayton, Ohio, who began her work as interim rector on January 1, 2013. 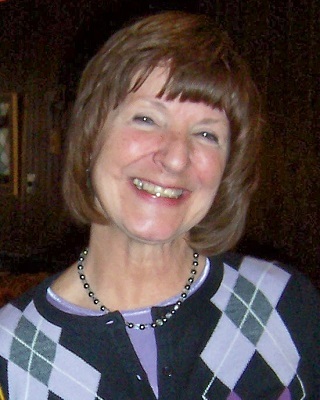 Maribeth Kussmaul, an independent professional training consultant who began working with our vestry as search coach in early spring of 2013. Once commissioned, the search committee began an ongoing process of mutual discernment with the vestry and the entire parish. They crafted a search prayer (see top of page) that was widely distributed for personal and common use. A series of Q&A sessions culminated in a churchwide Day of Discovery on Sunday, September 8. Parishioners gathered together in small and large groups to listen to our best experiences of St. Stephen’s, exploring what we have treasured about our past, what we want more of in our future, and what gifts and skills we’d hope for in our next rector. This input guided the search committee and vestry in developing a parish profile and brochure to help candidates find us. This marked the culmination of our congregational self-study and the beginning of our active rector search. 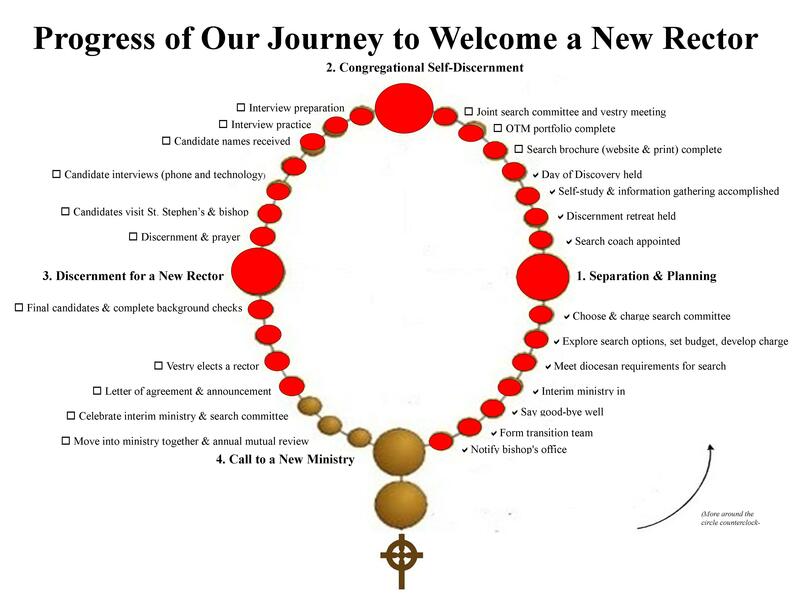 The graph below, which is based on an Anglican rosary, summarizes where we’ve been and, more important, where we’re going. (Red beads signify steps already completed.) Our planning goal was to extend the call to our new rector sometime during the summer of 2014. In mid-May of 2014, the process hit a small hiccup when a candidate was presented by the search committee to the vestry, but we learned that candidate had already accepted a call to another congregation. The search was reopened and the process continued. In June, our interim rector, Mary Slenski, believing her work of preparing us for transition was complete, accepted a call to another interim ministry in Indianapolis. The Rev. Bill Wieland accepted the request to serve as our long-term supply priest after Mary left in July. Finally, in mid-August, we called the Rev. Drew Downs to be our rector. He accepted and began work at St. Stephen’s on October 1 (click here for more details). In the coming months we look forward to getting to know one another better, celebrating Drew’s arrival and the work of the search committee, and continuing the journey with Drew and his family.